Binotel Integration is available as part of VoIP Integration extension. 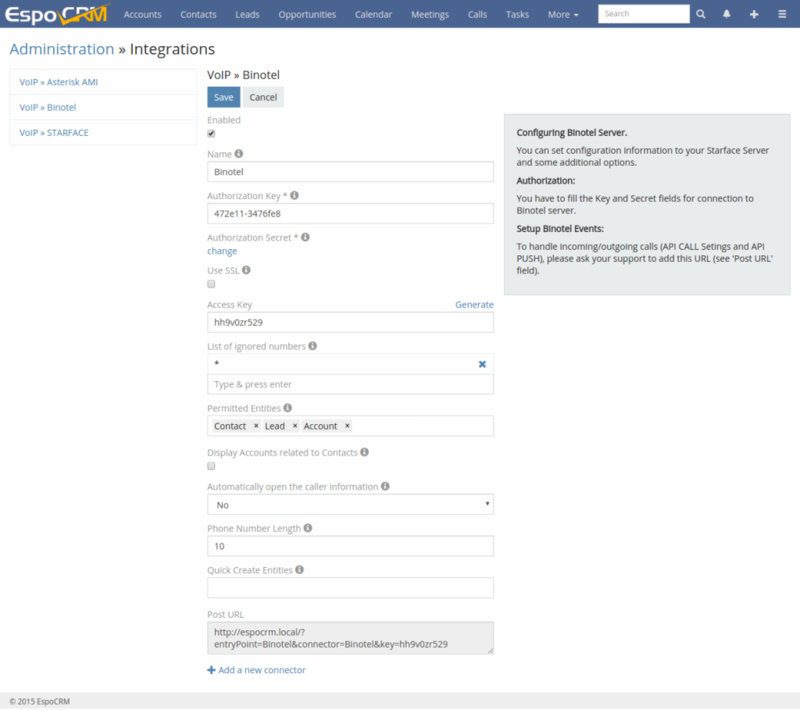 It allows to integrate EspoCRM with Asterisk server through Asterisk Manager Interface (AMI), Starface and Binotel server, read more details here. 1. Fill in the connection details of your Binotel server. For this go to the Administration (System panel) -> VoIP » Binotel. Name – name of your Binotel connector. Authorization Key – authorization Key to the Binotel server. Authorization Secret – authorization Secret to the Binotel server. 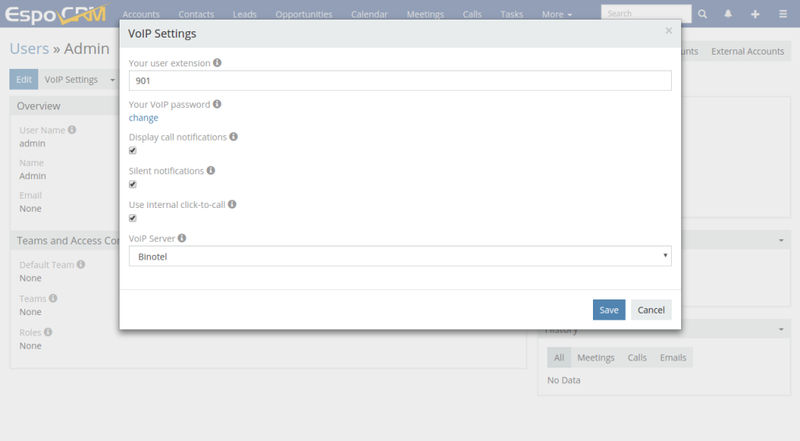 Access Key – the key to access to EspoCRM to handle incoming/outgoing calls. List of ignored numbers – list of numbers, which will be ignored and popup window will not be displayed. Display Accounts related to Contacts – display an account related to the contact in the popup window. Phone Number Length – the max length to display a phone number. Quick Create Entities – entities which can be created through a call popup. Post URL – URL uses to post information from Binotel server to EspoCRM. Each user who uses telephony should setup his user extension in User’s Profile, button “VoIP Settings”. Also, the user can disable a popup window for incoming/outgoing calls. Your user extension – your Binotel user extension (e.g. “299”, “1001”). Your VoIP password – your password to access to Binotel. Display call notifications – if you want to receive incoming/outgoing call notifications. Use internal click-to-call – switching internal click-to-call possibility. Internal click-to-call is a feature to originate an outgoing call. If the checkbox is unchecked, then will be used an external application to handle tel: links. VoIP Server – VoIP server selection.